As people age, their risks of developing eye diseases such as glaucoma increase. 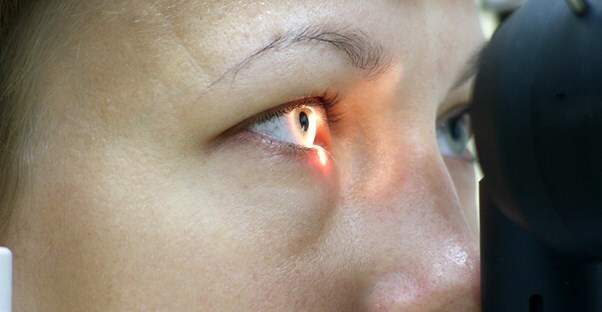 Glaucoma is the second leading cause of blindness, and it affects people all around the world. It is a disease that damages the optic nerve, the information pathway from the eye to the brain. There are three types of glaucoma: open-angle, closed-angle, and congenital. Open-angle glaucoma (OAG), the most common form in Canada and the United States, affects both eyes at once and very gradually causes the eye to lose peripheral vision. This can result in the total loss of vision. Closed-angle glaucoma (CAG) is more common in East Asia and can rapidly affect one or both eyes. CAG is more of a medical emergency that should be treated immediately. Congenital glaucoma is found in infants, who inherit it from parents or develop it from a mother's infection during pregnancy. While an exact cause has not been found, high intraocular pressure in the eyes is closely linked with glaucoma. Some experts believe this pressure is the cause of the nerve damage that associated with the disease. Medications like corticosteriods are thought to cause damage to the eye as well, possibly resulting in a case like glaucoma. It may also be developed through injury. Glaucoma symptoms include loss of vision, short periods of blurred vision or pain around the eye, halo phenomena, red eye, nausea, and vomiting. People with OAG will probably only experience vision loss; those with CAG may experience all of the above symptoms. Congenital glaucoma causes watery eyes and sensitivity to light. If the infant rubs the eyes or prefers to squint or keep them closed, he or she may have congenital glaucoma. Risk factors of glaucoma include family history, being over 40 years of age, diabetes, farsightedness, and high pressure in the eyes. You can significantly reduce your risk of glaucoma by regularly seeing your optometrist for dilated eye exams. Most insurance policies include at least a yearly eye exam. If the optometrist believes you may be at risk, eye drops can be prescribed to preserve vision and reduce intraocular pressure. Care should also be taken to reduce the risk of diabetes, or if you have diabetes, keep sugar levels at an appropriate rate. If you have a family history of glaucoma, do what you can now to reduce your risk. This is a life-altering disease that can cause partial and complete blindness. The steps you take now can preserve the health of your eyes.